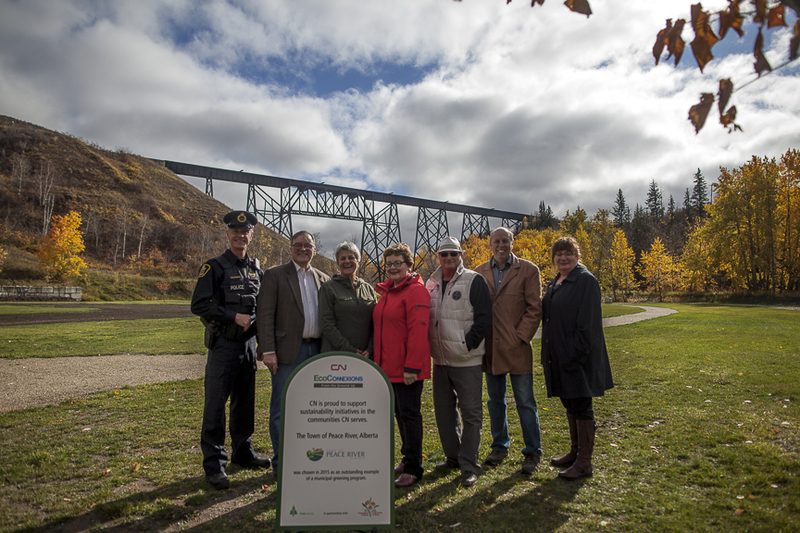 With support from Tree Canada, CN Rail and Northern Sunrise County, Peace River’s 12 Foot Davis Events Park is fast becoming cornerstone feature of downtown. 2015 was a busy summer of work on the site which included construction of: pedestrian pathways, site pad for stage area (graveled), top soil re-spread for seeding (previously the infield of a baseball diamond), build up of clay, along river edge, as a berm, those berms were covered in topsoil and seeded, shrubs to be planted along top, trees planted along pathway as you enter park, and trees planted at the south east corner of park. Through the CN Ecoconnextions grant and Tree Canada the Town of Peace River will be able to pepper the new park with 35 trees and shrubs of varying types. Later in the fall of that year, a concrete planter was installed along a retaining wall, trees and shrubs, the trail was compacted, and an additional tree bed was added at entrance of park. While work will continue through into 2017, significant portions have already been completed. Including the entrance sign, a perimeter road around the park, and acomplete pedestrian pathway and hillside re-contouring, to help prevent slides. The work is being completed in phases to allow for periodic evaluation of the project as it is installed. Once completed it will offer a first class park for future concerts, community events and much more. The space will be ideal for family picnics, gatherings, taking some time out to read a book or walk. 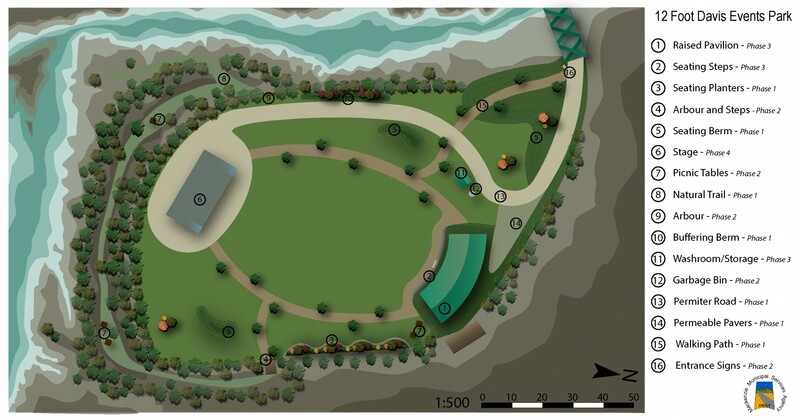 For more information please view the complete 12 Foot Davis Events Park development plan, produced by the Mackenzie Municipal Services Agency for the Town of Peace River.